The Australian-American Fulbright Commission has formalised three new partnerships with the ACT Government, Curtin University and the University of Canberra at a signing ceremony in Canberra on Tuesday 1 December 2015. The new Fulbright ACT Scholarship, Sponsored by the ACT Government will be available to Australian citizens at any level of study living and working in Canberra, and will focus on Entrepreneurship and Innovation. This is a new milestone for the Commission, which can now offer sponsored Fulbright Scholarships in every State and Territory in Australia. 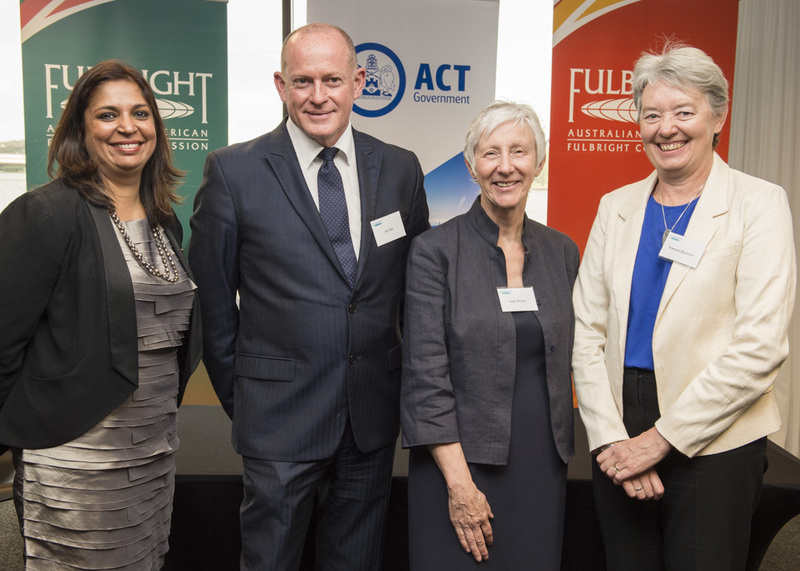 ACT Chief Minister Andrew Barr expressed his optimism at the future of the new Fulbright initiative. “The ACT Government is committed to promoting entrepreneurship and innovation, and I am confident that this partnership will further enhance our reputation as the ‘knowledge capital’ of Australia” Mr Barr said. The new Fulbright Senior Scholarship in Resources and Energy, Sponsored by Curtin University will bring a US Citizen each year to Curtin University to undertake research with particular focus on resources and energy. Curtin University Associate Deputy Vice-Chancellor, Professor Kate Wright had great expectations for the new Fulbright partnership. “Curtin’s vision is to change minds, change lives and change communities through its education and research. This includes overseas communities through collaboration with international partners. Through this partnership with the Fulbright Commission we hope to engage with exceptional American scholars of international repute to build sustainable research collaboration with US institutions.” Professor Wright said. The new Fulbright Senior Scholarship, Sponsored by the University of Canberra will attract leading US senior academics to undertake research at the University of Canberra for 4 months. Dr Tangerine Holt, Executive Director of the Australian-American Fulbright Commission, said that these new partnerships will encourage vital contributions to Australia’s burgeoning knowledge economy. “We are excited about the future of these initiatives, and the prospect of increased US engagement and knowledge translation that they will bring to institutions in Australia.” Dr Holt said. The new agreements were signed at a ceremony at the National Museum of Australia at 5:30pm on December 1. (Left to Right) Dr Tangerine Holt, Fulbright Executive Director; Mr Ian Cox, Executive Director, Innovation, Trade and Investment, ACT Government; Professor Kate Wright, Associate Deputy Vice-Chancellor, Curtin University; Professor Frances Shannon, Deputy Vice-Chancellor (Research), University of Canberra.